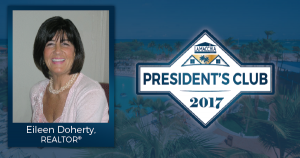 December 11, 2017 – Lamacchia Realty is happy to announce the newest member of their President’s Club, Eileen Doherty. Eileen so far this year has processed over $16.3 Million in real estate transactions. Eileen has been a top agent in Woburn for over 25 years. Having been born and raised there, it’s no wonder her local knowledge gets her clients what they need the most. Eileen strives to get her sellers more money than they thought possible and works to get her buyers the best deal on the home they want, which is why they love her! To learn more about Eileen, click here: Eileen Doherty.